Discussion in 'Downhill & Freeride' started by c2001, Jan 4, 2008.
check it...with full audio about specs and build and such. 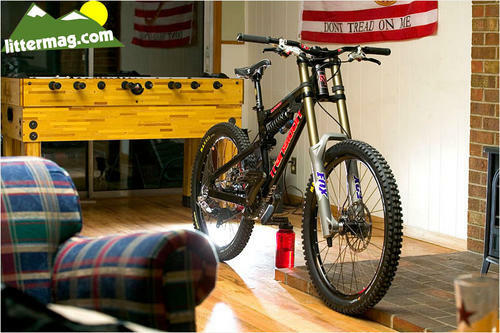 Holding the bike up with a water bottle is one of the most skillful things I have ever seen. I wanna play foosball now....thanks a lot! haters don't deserve such nice rides. sick stuff, pinner. I don't get the Blindside. Single pivot type suspension and the shock placed high on the bike. To me there seems to be other bike out there who have done this better? Great stuff! Nice pics and cool with the audio added. Looks like a really nice bike. edit: the real question is whether or not that bike is super d approved? and will it work in your coaching sessions? but blinded by the light would describe brads blindside from spectrum tech wear. Phil must have put on a happy face for the tape recorder or been being serviced while the interview was being conducted. I seriously doubt that to be true. HAHA, Phil's either gonna be a very happy man or a disappointed panda after this week! Don't have too much fun out there without me this time around! Watch out for in n out @ 10 am, it'll due you in! Ain't that right Fisher...YAK!!! What up Wentzy? Well we arrived in california just in time for the storm of the century. Looks like no riding will be happening this weekend. Rain wont keep us away from Anaheim supercross though. I'll be sure to post up some ride impressions once we can get on the trail. I almost forgot, you are all wankers and I hate everything. the most diabolical hater of them all. looks good phil, that yellow one is AWESOME. eren whats the paint deal on that bad boy? Brad at spectrum had it custom painted so sort of chromed yellow gold or something to that nature. saw it live today actually....it is green in natural/non-flash light with some ghosted in airbrush waves that you can almost make out in the pic. took his buddy 6 weeks to do it. the wheels were actually direct from transition gold, now they will not be avail to the public, I asked. The bike is stupid cool, now I want one . "I heard Brad was a hucker with no skill who secretly wants to be a racer bwouy!" well, i would say thats a true statement! he hucks. . with style.